Elluggua is a popular Orisha, a trickster that holds the power over luck and misfortune here as a gorgeous statue in bronze resin. Eluggua uses his power to afflict people with temptation and difficulties in order for them to mature. He is also the god of the roads and the protector of travelers. He is identified with Saint Anthony of Padua and Saint Michael. 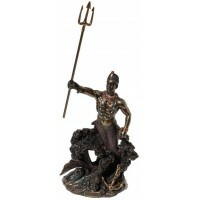 This beautifully finished cast bronze resin state stands 11 inches high with hand painted accents. Item Number: UI-WU76246A4 | Approximate Size (Inches): 4.50 wide x 3.00 deep x 8.78 high | Approximate Shipping Weight: 3.00 lbs.